A few months back, Vlad and I attended an entrepeneur event in Seattle. Michael Arrington was one of the speakers. He mentioned having a give-away token for a free Ooma, which he'd give to the first person that approached him for it after the session. Vlad was that person, and since he couldn't use it for some reason, he gave it to me. Ooma is a one-time-purchase device that gives you VOIP phone service over your broadband with no monthly charges, no long distance charges in US, a broadband voicemail box, etc. Your regular household phone(s) plug into it, and then you use the phone as you would normally. You could view it as a hardware device purchase, or you could view it as a lifetime subscription option to phone service. Spend a few hundred now, no phone bill later (or forever). I filled out some online forms, and a couple months later, after I'd forgotten all about it, a big honkin box arrived in the mail. I still haven't hooked it up (for reasons I'll get into later), but I did want to talk about the packaging. 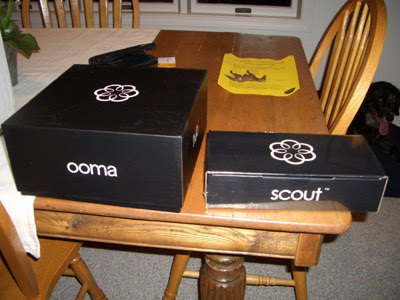 The gizmos (the Ooma, and an an auxilliary 'scout' device) each arrived in a very attractive, very HEAVY, glossy cardboard box. 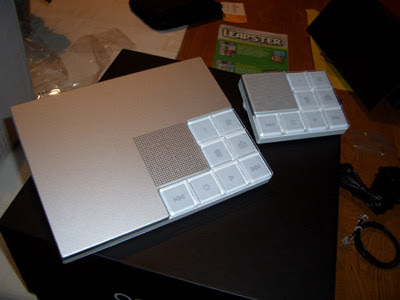 This is what the devices look like. Anyhow. The box is super thick, with a cover that is five sides of a cube and slides off of another five sided cube to reveal a felt-covered plastic 'holder' for the OOMA, which conceals the AC adapter, cables, etc. There's a also a large glossy manual and quick-start guide. The thing this made me think of is just how much everyone has been influenced by the Apple out-of-box experience ('OOBE'). I've heard (sorry, have never purchased an Apple product), the Apple OOBE described in near-fetishist, near-religious, fashion by those that have bought their products. It's clear that others are aspiring to capture the same type of feeling. Ooma's not the only culprit. I've purchased a couple Zune's and they are definitely mimicking the same thing. Xbox360 as well to a lesser degree. How soon before this backfires with the environmental movement? Others have learned a lesson here (Barbie was an example featured in Fast Company recently). What's the cost of the packaging, and could the savings be passed on to the consumer? Again, borrowing from teh Barbie example, could the packaging be practical? Why not sell Zune's or Ipod's packaged in a leather or rubber protective case - an accessory people often buy anyway? 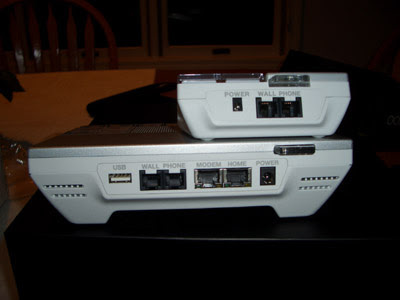 For those that are curious, here's a shot of the ports on the back.